As the creator and executive producer of Discovery Channel's Emmy-nominated series Dirty Jobs With Mike Rowe, Mike has spent years traveling the country, working as an apprentice on more than 200 jobs that most people would go out of their way to avoid. From coal mining to roustabouting, maggot farming to sheep castrating, Mike has worked in just about every industry and filmed the show in almost every state, celebrating the hard-working Americans who make civilized life possible for the rest of us. No one is better suited to the role of good-natured guinea pig than Mike — mainly because it's not a role. Dirty Jobs is entirely unscripted, and Mike doesn't cheat; he actually does the work, with a sense of humor rarely portrayed in such professions. In fact, the notion of depicting hard work as noble and fun is central to his personal mission. On Labor Day 2008, Mike launched a Web site called mikeroweWORKS.com, where skilled labor and hard work are celebrated in the hope of calling attention to the steady decline in the trades and bolstering enrollment in trade schools and technical colleges. In addition to Dirty Jobs and his mikeroweWORKS endeavor, Mike is the voice of Deadliest Catch and the national spokesman for Ford Trucks. He has traveled extensively for Discovery Channel, hosting Shark Week in South Africa, where he field-tested a steel-mesh "shark-suit," and Egypt Week Live, where he opened and explored newly discovered tombs in the Valley of the Golden Mummies. Before Dirty Jobs, Mike's resume was no less eclectic. Without any formal training, he began his career as a professional musician, faking his way into the Baltimore Opera, and earning his union card in the process. Soon thereafter, he crashed an audition for the QVC Cable Shopping Channel, where he was immediately hired to sell dubious merchandise in the middle of the night. There, he impersonated a host for nearly three years, spending most of his tenure on double-secret probation, while learning the ins and outs of live television. After that, he worked when he felt like it, narrating, writing, acting and hosting programs like Worst Case Scenario for TBS, On-Air TV for American Airlines, The Most for History Channel, No Relation for Fox and New York Expeditions for PBS. Interests/Hobbies: Reading, writing and a bit of running. 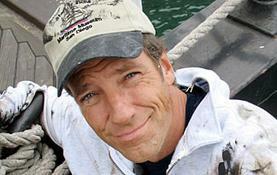 On Hosting Dirty Jobs: "Be careful what you wish for."